I have to admit it, but with the release of this phablet Samsung had managed to create an almost perfectly designed device. The South Korean manufacturer not only mastered the curve of the screen, they also developed a case which delivered a perfect grip. While feel of the S7 Edge isn’t bad in itself, and Samsung made noticeable progress in this area when compared to devices like the S6 Edge, the Note 7 simply managed to raise the bar to a higher level in providing an ideal user experience. Yes, the Galaxy Note 7 was not actually revolutionary in terms of appearance and haptics because, ultimately, it belonged to the S7 family. That said, with the Note 7 Samsung made improvements to many of the smaller details. The Note 7 had several advantages, from its dual-edge screen functions to more aesthetic features, and all the while provided an excellent handling experience. All this in a very compact format for a smartphone that, despite all of these features, had a 5.66-inch screen. In brief, Samsung had finally achieved its goal. Besides its seductive design, the Galaxy Note 7 was the most comprehensive high-quality Android smartphone to be released into the market. The smartphone offered a performance worthy of a flagship device thanks to its Qualcomm Snapdragon 820 SoC and its 4 GB of RAM. Of course, it was also compatible with Vulkan, which is ideal for the major gamers. Add to this an IP68 certification, a USB Type-C port, a Gorilla Glass 5 lens, an S Pen stylus and even an iris scanner. Other than its relative speed, the main advantage of using an iris scanner on a smartphone is the added security it brings to your device. Fans of virtual reality were not neglected either: during its brief time on the market, the Galaxy Note 7 and its QHD screen were accompanied by a new Gear VR headset. Finally, it is difficult not to mention the excellent camera phone the Note 7 had. Its main 12 MP camera with an aperture of f/1.7 and Dual Pixel technology all provided very detailed shots with a large contrast. Its fine tuning was simply the best available on the market. The Galaxy Note 7 certainly had some flaws. Sound was never its best feature, and the device was not very affordable. Above all else, its biggest issue was with its battery. As we now all know, the consequences of this were terrible and Samsung was forced to issue a recall notice for all Note 7 devices. With this smartphone, Samsung proved one thing to me that I thought I would leave behind as I aged: we always want what we cannot have. Were you also looking forward to buying the Galaxy Note 7? Will you still consider buying Samsung smartphones in the future? Let us know! The Note7 was the BEST smartphone of 2016 period. Then the S7 and S7Edge as well as S7Active was an easy 2nd. Everything else was obsolete. 3.5 mil released in the wild. CRITICAL LEVEL Of ALPHA -for determining whether a result can be judged statistically significant is conventionally set at .05. Great... So you, yourself, actually have more chance of getting struck TWICE by lightning while sitting next to ME... in MY house... on February 29, 2017... while we watch the Summer Olympics! All of these so called "explosions" happened within a month. That's a "burn rate" of about 2.6 devices/day. But yet you don't even question the fact there's been NOT ONE... ZIP, ZERO, ZILCH... NUTHIN'... ABSOLUTELY NO... Incidence since the day after recall. Samsung, with more resources than every smartphone company combined, a company that has in excess of 72 Billion sitting in cash reserves... Are you telling me THAT company can't reverse engineer a smartphone?? Less than a month after launch?? That they themselves just created a month prior?? and then find, fix, and forget a "problem" causing the Flagship Note7 to "EXPLODE"?? Give. Me. A. Friggin. Break. I could give Two Sh!ts and G!ggles as to WHY it happened. I'm not even concerned with the theory of conspiracies stating someone or some entity set to take this phone and/or company down by pushing stories relentlessly to the media,a nd in turn to the general public. Though it seems to be the most plausible explanation... other than Samsung sabotaging themselves over a Patent patent or something. Sounds almost as ignorant as discontinuing a device that is indisputably and unequivocally "The Greatest Phone EVER Made"
Kinda puts things in perspective... huh? This article is typically a "crocodile tear". First they kill and eat and then they cry. A championship of hypocrisy. Guys the thing blows up I sure hope that is not the best android has to show for. when something blows up is not good therefore not the best. Samsung made a mistake and then it did it again, Twice get over it. As America had Snapdragon internals and Europe had Exynos, I wondered how many actual Exynos phones burnt in relation to Snapdragon. There was a heating worry about the 810, which is why Sammy avoided installing it in their phones- perhaps the 820 was just as bad, or in Note 7's case, a lot worse. The scary part about this article is that there really hasn't been an adequate replacement offered by any of the other Android OEM's. 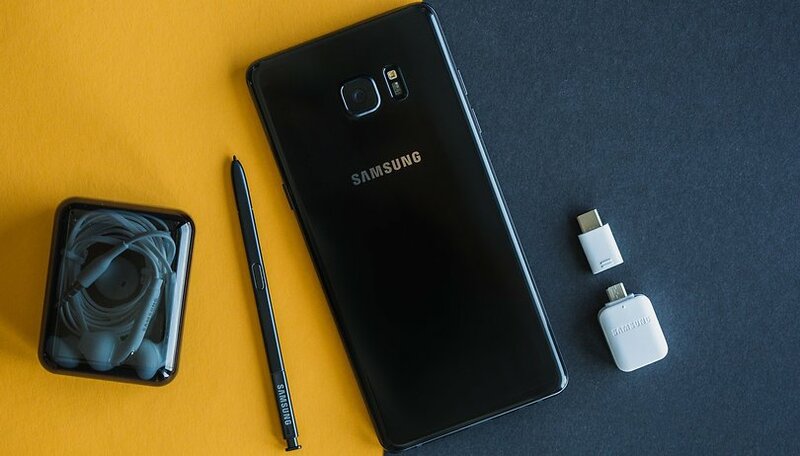 They are still several recent article lamenting the demise of the Note 7 and for several Android users this will be a lost year regarding phone upgrades. The article really hits home as I've always speculated that many people consider Samsung to be Android and I'm watching my theory unfold with Android Wear OEM's (Motorola , Huawei) running from the OS as Samsung continues to gain market share with TIZEN on the Gear S 2,3 models. I would have bought one, but here in UK, they were stopped quickly after launch. I always wait a few months on a new phone release so they can iron out any niggles, so only read of the aggro accrued to the N7. One hell of a shame - looked a cracker.